If you are a home cinema fanatic who takes your projectors really seriously you may well be interested in Sanyo’s latest top-end projector offering. 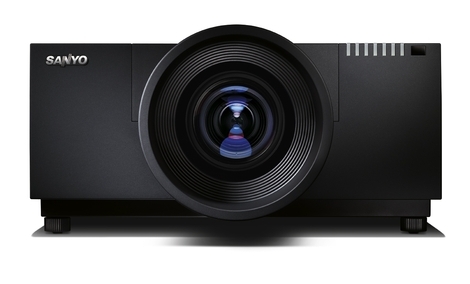 Professional in quality, the PLV-HF10000L is their top product in a new line of projectors just released. With a phenomenal 10 000 lumen brightness and a contrast ratio of 3000:1 it’s suitable for digital cinema, big events, simulations and the rental business. The PLV-HF10000L also boasts native 2K resolution, innovative QuaDrive technology. Its integrated edge blending function is useful for big-scale projections because it means that the image from the projector can be tallied up with images from other projectors to create panoramic images or just a huge screen. Pictured above, the little blighter also claims to be robust, with the lens set firmly in the centre. Though the price will only be announced closer to the November release date, it looks likely to be pushing the £1000 mark. At the more affordable end of the spectrum, they’ve also released two for simpler set-ups: offices, homes and schools. Their two new LCD projectors are called the PLC-XD2200 and PLC-XD2600. At 2200 ANSI lumens and 2600 ANSI lumens, these are less fiercely bright. Sanyo say these are ideal for use in presentations in businesses or schools, with ceiling installation and embedded networking enabling remote monitoring and control across the network. They say a lamp life of up to 6000 hours will help to keep running costs down. See the Sanyo Projector Range. The high technology of new sanyo projector makes it different others projectors.